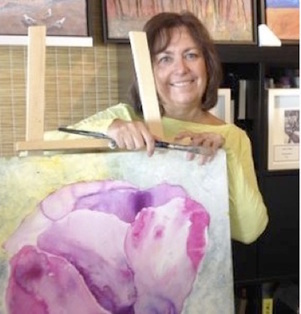 Creating is an essential part of Cathy’s life and painting is the vehicle to her creativity. Choosing to work in a contemporary style, she presents an attractive & diverse collection of both style and images in acrylic, watercolour and mixed media. Often taking inspiration from the lakeside views, her home studio in Port Colborne, the Shoreline Art Studio, displays original paintings which echo the “shoreline seasons”. Sometimes reflecting a sense of impressionistic realism, her paintings represent the immediacy of a moment. Cathy’s artwork reveals an experienced artist’s interpretation of feelings, emotions and artistic individuality. She regularly travels across North America taking classes and workshops from renowned contemporary artists and teachers. At home, she facilitates children’s art camps and lessons, as well as teaching classes in watercolours to adults. She has had numerous solo exhibits, shows her work in juried shows in the Niagara area and she is represented by Arts Place Art Gallery in Port Colborne.